The 1911-D Indian Head Eagle is a key date gold coin in the $10 Eagle series. In 1907 the Coronet $10 Eagle was replaced by an Indian Head design of Augustus Saint-Gaudens, one of America’s most famous sculptors. The Indian Head Eagle was coined until 1933, with several lengthy intervals after 1920 with no production. The 1911-D Indian Head Eagle had a mintage of 30,100, making it the smallest output of regular issue pieces in the series. The reason given for this paltry yield was that in 1911 the Denver Mint was preoccupied with Lincoln Cent production (12.7 million) and the Barber Dime (11.2 million). Much of the Mint’s capacity was committed to these minor coin denominations. Quarter Eagle and Half Eagle gold coin output was also greatly curtailed in 1911. Since then, the 1911-D has been considered one of the key dates in the Indian Head Eagle series. It is especially rare in Uncirculated grades. 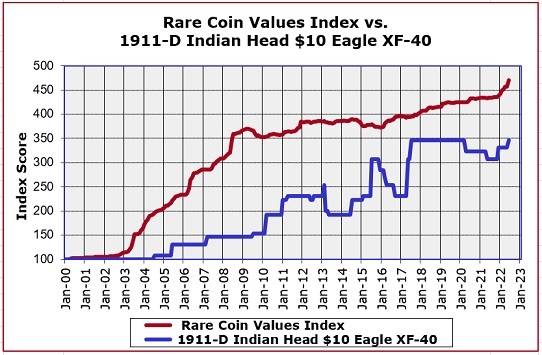 The blue line in the graph above illustrates the percent increase in value of the 1911-D Indian Head $10 Eagle in XF-40 condition, using Jan 2000 as a baseline. For a significant rare gold coin, the performance has been somewhat flat, especially compared to the Rare Coin Values Index, as illustrated by the red line. The Index is a measure of percent change in value over the same time period of a cross-sectional group of 87 rare United States coins. The objective of the Index is to get a feel for the strength of the overall rare US coin market. The 1911-D Eagle is one of the 87 coins tracked in the Index. All Index data is updated monthly.